If wars are costly and risky to both sides, why do they occur? Why engage in an arms race when it’s clear that increasing one’s own defense expenditures will only trigger a similar reaction by the other side, leaving both countries just as insecure—and considerably poorer? Just as people buy expensive things precisely because they are more expensive, because they offer the possibility of improved social status or prestige, so too do countries, argues Lilach Gilady. 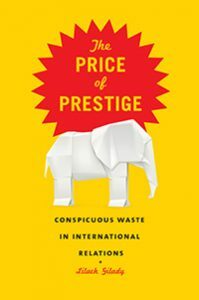 In The Price of Prestige, Gilady shows how many seemingly wasteful government expenditures that appear to contradict the laws of demand actually follow the pattern for what are known as Veblen goods, or positional goods for which demand increases alongside price, even when cheaper substitutes are readily available. From flashy space programs to costly weapons systems a country does not need and cannot maintain to foreign aid programs that offer little benefit to recipients, these conspicuous and strategically timed expenditures are intended to instill awe in the observer through their wasteful might. And underestimating the important social role of excess has serious policy implications. Increasing the cost of war, for example, may not always be an effective tool for preventing it, Gilady argues, nor does decreasing the cost of weapons and other technologies of war necessarily increase the potential for conflict, as shown by the case of a cheap fighter plane whose price tag drove consumers away. In today’s changing world, where there are high levels of uncertainty about the distribution of power, Gilady also offers a valuable way to predict which countries are most likely to be concerned about their position and therefore adopt costly, excessive policies.